The bougie is an adjunct for difficult endotracheal intubation. For directional control during routine or difficult endotracheal intubation when the laryngeal inlet cannot be completely seen. Excessive force, passage beyond the carina, or blind introduction may result in soft tissue damage or may cause rupture of the bronchus. 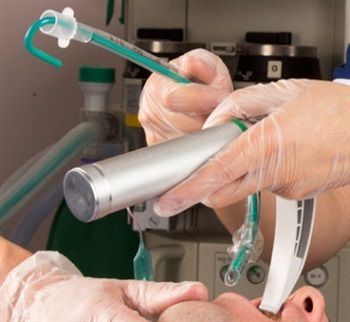 The endotracheal tube should not be threaded over the introducer without the laryngoscope in place. 1. A 15 French introducer should be used for endotracheal tube sizes 6.0 to 11.0. 4. Place introducer into the pharynx and direct into larynx. If necessary, bend the introducer to negotiate the corner. Correct placement may be confirmed by detection of tracheal "clicks" and "hold up" of the bougie - no hold up indicates oesophageal placement. 5. Leave laryngoscope in place while assistant threads endotracheal tube over introducer into trachea. If tube sticks at the laryngeal inlet, a 90° counter clockwise rotation may help. A 10 French introducer should be used for endotracheal tube sizes 4.0 to 5.5. Single-use malleable intubation stylets for pre-forming tracheal tubes to the desired shape to facilitate intubation.